The 2014 FIFA World Cup in Brazil is just around the corner and global industrial & automotive lubricants brand Castrol have come up with an ingenious way of promoting the event. 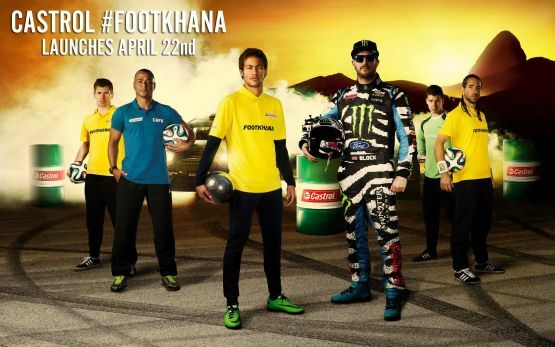 The Castrol Footkhana is a series of football matches which features Brazil and FC Barcelona winger Neymar Jr., Hoonigan Racing Division’s rally driver Ken Block, Brazilian football stalwart Cafu, and football freestyler Séan Garnier. The Footkhana showcases vs. matches which pit all the contenders against each other in a amazing display of man and machine. As of now Castrol have just released a set of trailers in which Neymar, Cafu and Séan’s sublime footballing skills are put to the test by some insane asphalt-shredding driving by Block. So choose your team – Neymar Jr. or Ken Block in the ultimate skills showdown! And stay tuned because the first feature in this Castrol special premieres online later today, and we’ll bring it here as soon as it does.